which is located at the Alameda Campus. The congress centre is located inside the Civil Engineering Pavilion (number 2 on the map). 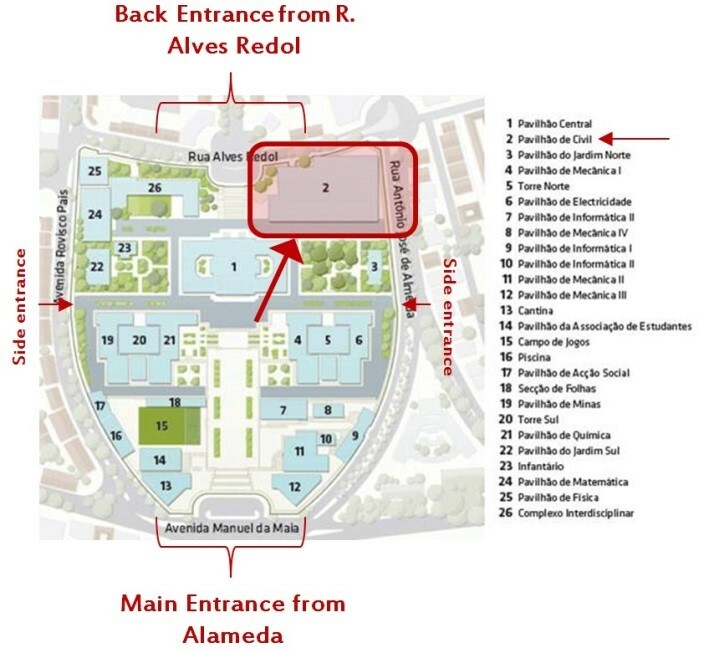 There is one main entrance to the campus via Alameda (marked on the map), two side entrances (from Av. Rovisco Pais and R. António de Almeida) and one back entrance from Rua Alves Redol. All events will take place at the Civil Engineering pavilion. The IST Alameda Campus can be reached by metro to the station Alameda (a ticket costs €1.95), or by bus to one of the many surrounding stops (a ticket on board costs €1.85). Alternatively, you can reach the campus by Taxi/Uber/Cabify (variable prices). If you bring your own car, be aware that parking inside the Campus is staff only, so you will have to park your vehicle in the surrounding areas, subjected to an EMEL meter that you’ll have to pay.